As Memorial Day approaches and we prepare to set aside a special time to remember those who have given their lives for our freedom, we wanted to take a moment and share a beautiful story with you about a Beach Club boy and a wounded warrior. Justin, a 4th grade Beach Clubber from Euless, Texas, lost his dad in 2009 to ALS and last summer he received a $2,000 inheritance from his father. To Justin this amount of money might as well have been a million dollars and he felt like he had to share it with someone in need. He saw a clip on television of an NFL player who had once been homeless and now makes a lot of money and is helping others because someone helped him get back up after a fall. This story inspired Justin and he began searching for a way to help someone else. 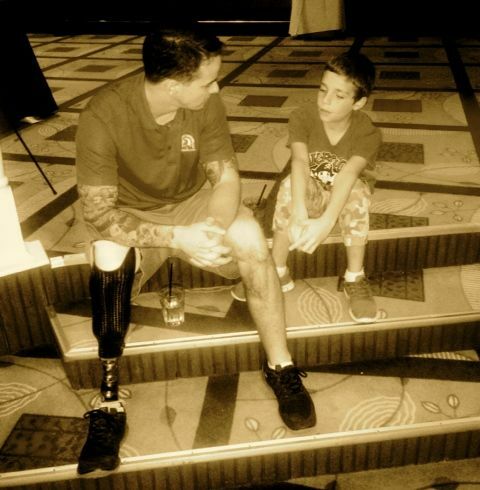 Talking to his mom one day, Justin learned about Texas Sentinels Foundation and what they do for veterans. He learned about a Marine named Sgt. Erich Ellis and how a fundraiser was going to be held to support building a fully furnished home for this wounded warrior. Justin immediately decided to use a portion of his inheritance to sponsor a table at the fundraiser. In a room full of charitable-hearted adults there was a little boy following Sgt. Ellis around. Dressed in a red t-shirt, to match his hero's, and camouflage pants that were just a little too short, Justin looked out of place and perfect, all at the same time. Justin shared how he wishes for a world without war, but understands that it is still very much a part of our world and he has a great respect for veterans. He was so happy to help Sgt. Ellis get a new home. In June 2012, on his fourth tour of duty in Afghanistan, Sgt. Ellis stepped on an Improvised Explosive Device (IED) while on a United States Marine Corps Forces Special Operations Command (MARSOC) deployment. Resulting in the amputation of his right leg from the knee down, Sgt. Ellis underwent ten surgeries within the first 30 days of his injury. Embodying the characteristics of a true American hero, Sgt. Ellis was awarded the Purple Heart for his sacrifice and courageous service. Sgt. Ellis was extremely touched by Justin's action to support building a home for him and he and Justin have forged a friendship that will surely last.